Will play host to Santa Clara Wednesday at 9 p.m. Junior guard Miles Dixon led the Raiders with 14 points off the bench in the win. Down five with 10 minutes remaining, the men’s basketball team outscored Richmond 23-12 the rest of the way to post a 57-51 win over the Spiders in the CBI quarterfinals Monday night at the Wright State University Nutter Center. In a game that featured 15 ties and 16 lead changes, neither team had more than a three-point lead the entire first half, with Richmond holding a slim 26-23 edge at the break thanks to baskets from Cedrick Lindsay and Wayne Sparrow. Wright State shot 52 percent from the field in the opening 20 minutes, but was just one of six from three-point range and didn’t attempt a free throw while the Spiders shot 46 percent overall, were two of 10 from behind the arc and hit two of four foul shots. Junior forward Jerran Young scored 13 points, making five free throws on six attempts and also grabbed seven rebounds. The Raiders scored the first six points of the second half, including a three-point play by Miles Dixon, only to see Richmond follow with a 13-5 run over the next seven mintutes to go up 39-34. Two AJ Pacher free throws and a JT Yoho three-point play put Wright State back in front 41-40 at the 8:07 mark, but the Spiders regained the lead at 48-45 on back-to-back Lindsay baskets with 4:13 left. Reggie Arceneaux, however, tied it with a three and after Dixon put the Raiders ahead for good with a layup at the 2:39 mark, Jerran Young capped off a 9-0 run with a jumper and a fast-break dunk with 1:08 remaining. Greg Robbins answered for Richmond with a three at the 42.4-second mark, but that would be all the closer the Spiders would get as Young scored the final three points of the game at the foul line. 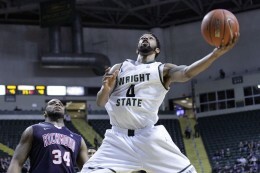 With the win, Wright State (23-12) tied the 2006-07 squad (23-10) for the most wins in its 26-year Division I history. For the game, the Raiders shot 46 percent and were 14 of 18 at the foul line compared to 42 percent shooting and nine of 16 foul shooting for Richmond. Dixon led all scorers with 14 off the bench for Wright State while Young added 13 points, all but two coming in the second half, and also had seven rebounds. Robbins paced Richmond (19-15) with 12 points. Wright State now advances to the CBI semifinals on Wednesday, March 27, where the Raiders will host Santa Clara, an 86-83 winner over Purdue, at 9:00. That contest will mark the latest a Wright State team has played in a season, eclipsing the March 26, 1983 Division II national championship game against District of Columbia. The winner of Wednesday’s contest advances to the championship round against the winner of the other semifinal between Western Michigan and George Mason. The best of three series starts on Monday, April 1, with the second game on Wednesday, April 3, and the third game, if necessary, set for Friday, April 5. Wright State and Santa Clara have met twice before, with each team winning on its own home court. The Raiders defeated the Broncos 76-62 at the Nutter Center on December 15, 2001 while Santa Clara won 71-67 on December 30, 2002. The game will be shown live on AXS TV, which is available in the Dayton area on DirecTV Channel 340, AT&T U-Verse Channel 1106 and Dish Network Channel 362.